Jenna Shapiro thanks Fight Back volunteers. At left, U.S. Chris Murphy and Gary Turco. Jenna Shapiro woke up miserable the day after Donald J. Trump’s election in 2016. The 21-year-old daughter of Democratic activists from Manhattan, Shapiro had canvassed for Hillary Clinton in New Hampshire and worked on phone banks at Wesleyan, where she was a first-semester senior studying history and contemplating a career in teaching. She woke up happy after Election Day 2018. Now 23, Shapiro — who put off a career in education for political organizing after graduating in 2017 — was the Hartford regional coordinator for Fight Back Connecticut, the field organization U.S. Sen. Chris Murphy began assembling in early 2017 for the Democrats’ statewide coordinated campaign. In the final four days of the campaign, a staff of 20 paid organizers oversaw 14,000 volunteers who Murphy says knocked on roughly 250,000 doors and made one million phone calls. It was an element of a Democratic ground game that helped produce the best mid-term election turnout in Connecticut since 1990, contributing to an unexpectedly strong 44,500-vote plurality for Gov.-elect Ned Lamont and the first Democratic gains in the General Assembly since Barack Obama’s landslide win here a decade ago. Over pizza at local party headquarters in West Hartford last week, Shapiro was one of the young organizers who thanked the volunteers, a mix of first-timers and veterans, millennials and boomers, and everything in between. Joseph Hutton, the director of the coordinated campaign, peeked around a corner, standing next to Nick Marroletti, the organizing director. Hutton is 29, Marroletti, 25. Somewhere in the crowded room was Jenna Lowenstein, the 31-year-old who managed Murphy’s campaign. Murphy was last to arrive. He sat near Gary Turco, a Democrat from neighboring Newington who defeated a two-term Republican state representative by 66 votes. 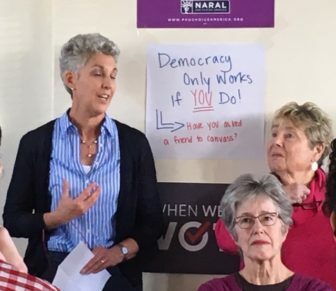 Turco credited Fight Back Connecticut and volunteers who came from West Hartford, where they had run out of doors to knock and phones to call. Turco smiled and said he would be happy to reciprocate by campaigning for Murphy in Iowa or New Hampshire in 2020. Murphy politely ignored the offer. Re-elected to a second term last week with 59.5 percent of the vote, Murphy seemed content to watch Shapiro and others run the show. Murphy was 22 when he managed his first campaign, Charlotte Koskoff’s challenge of U.S. Rep. Nancy Johnson in 1996. Koskoff lost by just 1,587 votes. Ten years later, it would be Murphy who finally took the western Connecticut seat for Democrats. He ran as an opponent of the war in Iraq, giving him common cause with Lamont, who defeated Sen. Joseph I. Lieberman in a primary. Lieberman won as an independent in the fall, but retired in 2012 rather than run without a party’s backing. Murphy succeeded Lieberman in the Senate. With Gov. Dannel P. Malloy exiting after two terms, it was Murphy who took control of the statewide coordinated campaign, personally interviewing and signing off on its top hires. Lamont, 64, will be Connecticut’s governor in January. Richard Blumenthal, 72, is its senior senator. But at 45, Murphy is the leader of a generation reshaping the Democratic Party in Connecticut. At a key juncture, he urged other Democratic contenders to coalesce around Lamont. And he encouraged Jahana Hayes, the 2016 national teacher of the year, to run for his old seat in the 5th District, giving Connecticut Democrats their first black nominee for Congress. Hayes will join the 116th Congress as one of the first two black women from New England to serve in the U.S. House. Murphy says Fight Back Connecticut was effectively born during the Women’s March, the day after Trump’s inauguration. It was a massive outpouring that filled Washington DC., with satellite demonstrations staged the same day across the U.S., including 10,000 outside the State Capitol in Hartford, and in cities around the globe. Top left, Nick Marroletti and Joseph Hutton. Marroletti was the first hire, joining Fight Back in March 2017, less than two years after finishing his undergraduate studies at New York University. In 2016, he was a field organizer for Hillary Clinton in Iowa, where he recruited and trained two dozen precinct leaders in a rural eastern county before the caucuses, then did a similar job in Kansas. He ended the cycle as the regional organizing director for the Democrats’ coordinated campaign in North Carolina. Using small house parties, some featuring internet video connections with Murphy, the effort slowly built. Organizers found volunteers, who in turn became recruiters for other volunteers. They tried to complement Action Together Connecticut, Indivisible and other grass-roots groups that flowered after the 2016 election. Trump was a constant, if unwitting, ally. A seemingly unending list of the president’s policy initiatives mobilized the left, including efforts to ban immigration from Muslim-dominant nations, attacks on the Affordable Care Act, attacks on the courts and Department of Justice, opposition to abortion rights, reversal of protections for transgender youths and military personnel, his refusal to unambiguously denounce white nationalists, and the rejection of climate science and promotion of coal-burning power plants. Murphy said the energy was palpable — the only challenge was how to direct it. The victory was not just Murphy’s, nor the turnout exclusively the work of Fight Back. The coordinated campaign, which Lamont embraced, largely worked in places where they could mine veins of straight-ticket voters. The larger ground game — identifying and pulling supportive voters to the polls — ran the gamut. Candidates like James Albis of East Haven, a state representative seeking re-election in a blue-collar Democratic district carried by Trump in 2016, organized their own field operations, buttressed by volunteers sent by the House and Senate Democratic caucuses and canvassing by the union-funded Working Families Party. Albis won by only 11 votes two years ago. Last Tuesday, he was re-elected with 58 percent of the vote, outperforming the top of the ticket in his community: Murphy carried East Haven with 51 percent, while Lamont lost with 40 percent. Albis credits the party’s ground game. Tracy Frankel, standing, was among the early volunteers. 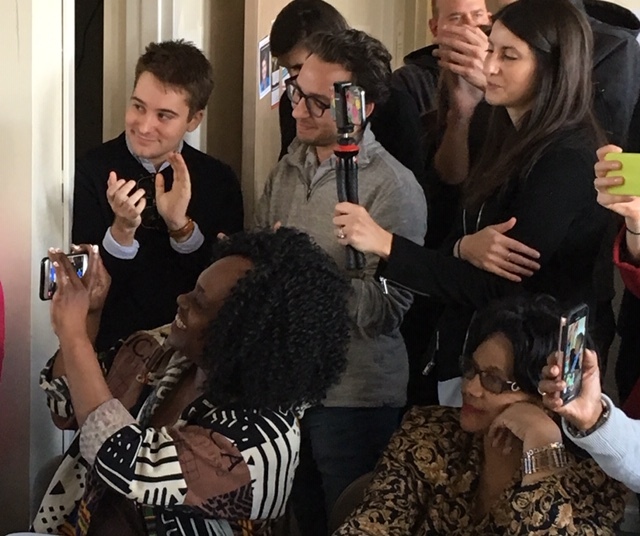 Will Haskell, the 22-year-old Democrat who unseated state Sen. Toni Boucher, R-Wilton, in one of the year’s big upsets, said Fight Back Connecticut worked closely with his campaign and the Democratic Town Committees in his well-to-do Fairfield County district. Fight Back worked on turnout, leaving messaging to Haskell. The Murphy touch was personal, Haskell said. Haskell was a Georgetown University student when he first contacted Murphy’s office about running. He was encouraged by Murphy’s staff and, later, by Murphy. On Election Day, Murphy stood with Haskell outside a polling place in Westport, greeting voters arriving for the late-afternoon rush. Murphy stayed for an hour. Murphy said Fight Back Connecticut’s larger goal beyond winning 2018 was to build an organization that will help Democrats in municipal races next year and preserve legislative majorities in 2020. A cautionary lesson for Democrats is that they swept the congressional races and won supermajorities in the General Assembly in 2008. From the high of 2008, the legislative majority steadily eroded. Of course, many were inspired, albeit in a negative way, by a president not on the ballot this year. He says he will be on the ballot in 2020.